Why does this matter? Because when you have a powerful site like Target.com and you start hanging millions of pages off of it you are bound to get some decent rankings regardless of how terrible your page is. 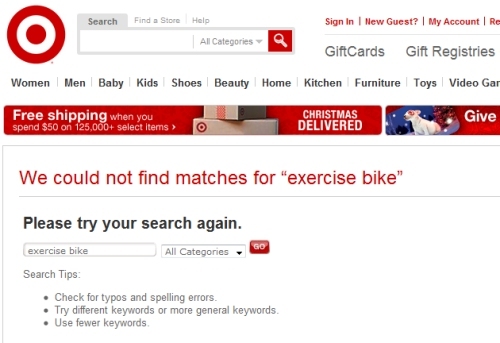 For example Target.com is currently ranking #1 for Exercise Bike Clearance. Imagine if each page generates just one visitor each day. We are talking millions of Google users being tricked into visiting Target.com. Does this page really live up to Google’s rhetoric about delivering a good user experience? Instead of Google removing these pages that are obviously error pages they instead are rewarding Target’s spam attempt with high rankings and online holiday traffic. In case you think for one second that you should do this on your website – THINK TWICE. Google’s algorithm gives preferential treatment to big brand websites. Big brands have more links and more trustworthy websites referring to them. That link popularity is quite powerful in the Google algorithm. I am not even going to get into the quality signals that Google sees from the high level of toolbar usage coming from people visiting Target.com. The Target.com domain has so much power in the Google algorithm they can bend the Google quality rules more than any small mom & pop website can. Another thing to remember is that users searching on Google expect to see big brands in the search results. If they don’t see them they think that Google is broken. Google is in a difficult position. They need to balance user expectation of seeing big brands in the serps while still controlling the big brands. I just hope that something is done because Google users deserve higher quality serps & smaller retailers deserve more equality when it comes to Google’s quality standards.